Winner of this year’s Malta Lace Competition Carmen Ellul (second from right) with (from left) HSBC’s Doriette Camilleri, Cristina Farrugia, HSBC’s deputy CFO Josephine Magri and Marquis Nicholas de Piro. “Maltese lace stands shoulder to shoulder with the world’s finest. Each year, we notice improvements in the quality and originality of works,” said Marquis Nicholas de Piro showing an example of Maltese black silk bobbin lacework. 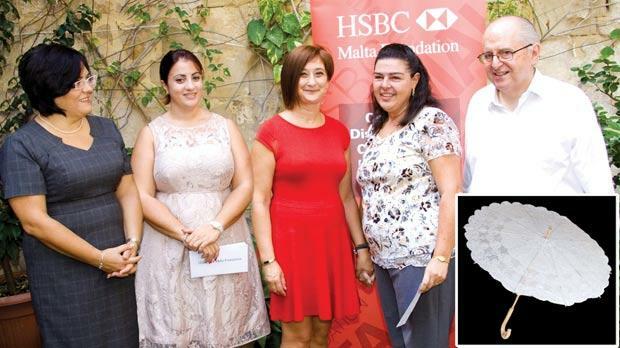 Marquis de Piro organises the annual Malta Lace Competition with the HSBC Malta Foundation’s support. This year the competition ceremony at Casa Rocca Piccola, Valletta, once again brought together lace-makers, collectors and other enthusiasts to celebrate the talent, originality and skill of Maltese lace-makers. “While we strive to safeguard its traditional elements, Maltese lace-making is an ever-evolving craft. We embrace this as a positive development, one that is reflected in the diversity of the competition’s categories,” said Marquis de Piro. The competition includes a Children’s Category for participants under the age of 16. While monetary prizes also went to the best submission in this group, all participants under 16 received token gifts as an encouragement to the young competitors andalso to reward their interest in lace-making. “The competition aims to bolster this important part of Malta’s historical and cultural heritage, keeping it alive and well,” explained Malta Lace Competition CEO Margaret Farrugia. Casa Rocca Piccola is home to an extensive collection of fine lace, many examples of which are to be showcased in Marquis de Piro’s forthcoming book Ladies of Malta in Extravagant and Spectacular Maltese Lace, expected to hit the bookshops in time for Christmas. The publication will feature a variety of distinguished professional and Maltese women personalities wearing the very finest of Maltese lace.